The word Diamond is derived from the Greek word "adamas" which means "hardest metal" which reflect the property of the stone. 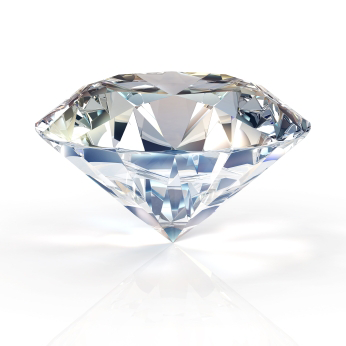 For those who were born in the month of April the Diamond is the traditional birthstone. The diamond is said to enhance relationships and increasing inner strength. The Traditional Metaphysical Properties for the April Birthstone Diamond are balance, clarity and abundance. The healing properties of the diamond are reputed to be effective for health problems relating to brain diseases, pituitary glands. The Diamond is also used to draw out toxins and therefore was used as a remedy for poison. The diamond is a precious stone or gem excelling in brilliancy and beautiful play of prismatic colours, and remarkable for its extreme hardness. This gem is a member of the Diamond (Carbon) family. It is the hardest substance known. The diamond as found in nature (called a rough diamond) is cut, for use in jewellery, into various forms with many reflecting facets, by which its brilliancy is much increased. The crystal structure of the Diamond is Isometric.The traditional colour associated with the Diamond is white, or colourless but diamonds come in a wide range of colours such as black, blue, green, pink, red, purple, orange and yellow. The colour is dependent upon the type of impurities that are present in the stone. Yellow stones have minuscule traces of nitrogen while blue ones contain boron. This gemstone is mined mainly in Australia, Ghana, Zaire, Russia, USA and Brazil.. Ancient theories touting the magical powers of diamonds are prevalent throughout history some thought lightning bolts formed diamonds, while other theories asserted that diamonds were the tears of god. The first recorded history of the diamond dates back some 3,000 years to India, where it is likely that diamonds were first valued for their ability to refract light. In those days, the diamond was used in two ways-for decorative purposes, and as a talisman to ward off evil or provide protection in battle. The diamond was also used for some time as medical aid. One anecdote, written during the Dark Ages by St Hildegarde, relates how a diamond held in the hand while making a sign of the cross would heal wounds and cure illnesses. Diamonds were also ingested in the hope of curing sickness. The popularity of diamonds surged during the Middle Ages, with the discovery of many large and famous stones in India, such as the Koh-I-Noor and the Blue Hope. Today India maintains the foremost diamond polishing industry in the world.